If someone had told ten year old me that not only would his adult self still be an avid gamer, he’d also be enamoured by a series of plays based upon, and set in, a world created solely for the purpose of an RPG system, he’d have leapt into the air, punched it a few times and then would probably have passed out after being overcome by excitement. In all fairness though, if ten year old me had told grown up me the same thing, I’d have needed to have a sit down and a refreshing brew after hearing the news as well. Not because of the gaming thing as the most that would have elicited would have been a shrug of the shoulders and a “Tell-me-something-I-don’t-know” roll of the eyes, but the idea that a game could be triumphantly transformed into an ongoing saga of audio stories, that would have been the bit that knocked me out. It’s been done before of course, with differing degrees of success. The Dungeons & Dragons cartoons for instance, which were incredibly entertaining, if a little simplistic, and the films based on the franchise, which were just as simplistic, but far less entertaining than their animated precursor. Oh, and let’s not forget the Warhammer 40,000 movie, the Black Library audio adaptations and the audio books of R.J. Salvatore’s novels, the majority of which are engaging and a pleasure to spend time with. 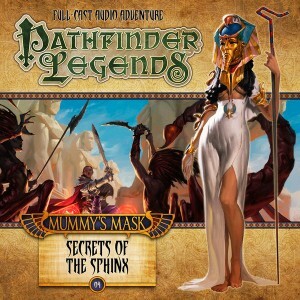 But none of the aforementioned have captured the essence or the spirit of gaming, the things that make it special and so beloved among its legions of fans, in the same way that Pathfinder Legends has. It’s got that same elusive spark, that thing that you can never place your finger on, that gaming possesses and it infects each and every story in the series, slowly building momentum and getting better and better with each successive chapter. And Secrets of the Sphinx is the best one yet.